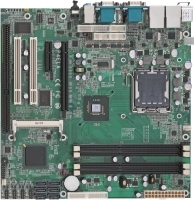 (TAIPEI, TAIWAN, 07.14, 2009) COMMELL, the worldwide leader of Industrial Single Board Computers, introduced the Industrial Micro ATX motherboard P4ELA that mainboard incorporates an Intel LGA775 pin-out compatible with Intel Core 2 Quad processor Q9400, Intel Core 2 Duo processors E8400, E7400, E6400 and E4300, Intel Dual-Core processors E5300 and E2160, and Intel Celeron processor 440 @ 1333/1066/800 MHz System Bus, The P4ELA platform based on Q45 Express chipset, is ideal for developing high-performance systems for industrial workstation, industrial control and automation, retail and hospitality, gaming, print imaging, digital signage, digital surveillance and network security applications. COMMELL's P4ELA supports DDR3 DIMM up to 8GB, and comes with PS/2 Keyboard and Mouse, 5 x RS232C and 1 x RS232/422/485, Networking is provided by two Intel 82574L Giga LAN, 8 x USB2.0 ports, HD audio, 6 x SATA2 interface, Expansion slots with one ISA, two PCI & one Mini PCI, one PCI-E 4X & one PCI-E 16X slots. Memory: 4 x DDR3 800/1066 MHz DIMM up to 8.0GB. I/O Ports: 5 x RS232 and 1 x RS232/422/485 Serial Ports, 8 x USB2.0 ports, 1 x DB15 VGA port, 1 x PS/2 keyboard and mouse ports. Extended Interface: 1x ISA, 2 x PCI slots, 1 x Mini-PCI socket, one PCI-E 16X & one PCI-E 4X.